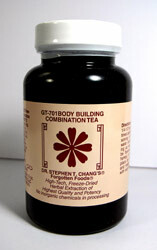 Chinese Herbal Formula multiple sclerosis, Immune System, surgery, Leukemia, AIDS, Anemia, antibiotics, radiation therapy, chemotherapy, cobalt treatment, Exhaustion, chronic infection, Blurry eyesight, circulation, appetite, lung function Body Building Combination from Dr. Chang Forgotten Foods contains Chinese Ginseng, Astragalus, Atractylodes, Poria, Tang Kuei, Paeonia, Rhemannia, Cnidium, Cinnamon, Coix. Ingredients: Chinese Ginseng, Astragalus, Atractylodes, Poria, Tang Kuei, Paeonia, Rhemannia, Cnidium, Cinnamon, Coix. Main Meridians: Energizes all meridians with emphasis on H, TH, LV, SP and L.
Revitalization of all internal organs; tonifies the entire body; blood building. Cancer: benefits enhanced when used in conjunction with other combinations. For example, colon cancer: GT-701 plus BD-216; liver cancer: GT-701 plus BD-404; stomach cancer: GT-701 plus FP-604; etc. Anemia, low blood count, low energy. Body building following depletion from excessive use of antibiotics, exposure to radiation (including radiation therapy), chemotherapy and cobalt treatments. Benefits enhanced with antibiotics for chronic infections. Blurry eyesight in conjunction with weak, depleted body.